NZ broadband in the dark ages or just a Hissy fit? Forums › New Zealand Broadband › NZ broadband in the dark ages or just a Hissy fit? 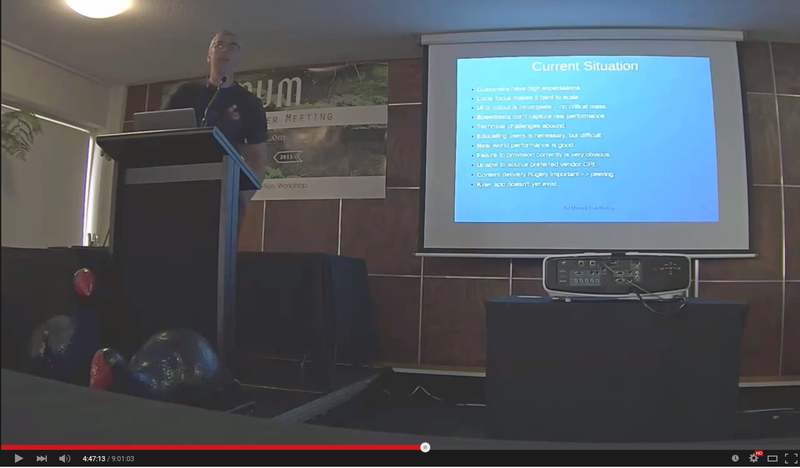 DonGould: Clearly most of you were not at the Mikrotik MUM on Monday where one ISP gave a detailed presentation of issues in Dunedin around UFB. It comes to me as no surprise that this guy has just hit the 'red button' after what I listened to from this ISP owner on Monday. It's no secret that there some shocking communication going on in Dunedin that's just causing endless end user frustration. Actually this is what happen if you rely on the media as your source of information. The complain is valid. It is a known issue in Dunedin. The council has promised solution to this. No, he didn't lose 4 million. Dunedin lost 4 million because the council and chorus messed up. He took the business to London instead. His comment has never meant to compare the speed of NZ Internet in general. The media put it that way. Internet and news sites is just full retard. In an industry that requires 100Mb-1Gb symmetric connections especially considering physical isolation meaning they would have a lot of remote workers in other countries rather than being entirely in an office, Is it really that surprising that they decided to move overseas? At this point (and yes it is getting better but very slowly for rollouts especially considering large MDU's) we have paid quicker non-ufb options with very high costs or UFB options where you basically have to relocate your business/home to a place already rolled out. Considering what we have seen from MDU and even non-MDU installs, Could you safely say you would sign a lease and open a business in NZ with the possibility of not being able to run your company for months because of install delays as opposed to doing so in another country where this was not an every day occurrence? And that is before even looking for a large capacity CIR connection at a decent price from a local provider. I would not and I don't believe any decent overseas designer would. I realize it is a case of "they are doing their best" but until this is all a thing of the past we are just going to get laughed at by anyone trying to run a business this sort of industry. Small companies are one thing but if you hope grow then you don't stand a chance here Yet. Wheelbarrow01: "He continued to scout for a new office in Dunedin but many buildings were not connected with fibre, or there was a long delay for installation and costs were high". Sounds like rubbish to me. I spend my entire day working on complex provisioning issues for Sparl Digital corporate UFB customers. I am personally overseeing at least 100 of these throughout the country right now, and I have only one solitary order where a financial contribution has been requested from the end customer - every other job is being subsidised in full by the Crown/LFC partnership, so his cost argument is at best misinformed, at worst totally false. He clearly does not understand the process at all - maybe his service provider never set a realistic expectation regarding difficulty and timeframe. It happens.... a lot. We are 10m from the fibre in the street, and it needed one hole cutting through the wall to reach us upstairs and two holes downstairs.... all simply in trunking on the side of the building (no driveway to dig up!!). Yet it was costed at ~$9500 to install 5 "straws" into the building (no fibre just the straws)! That was after a ridiculously long delay which added 9 months to our original "Go Live" date (when it was to be a free single install). I suspect we were ripped off, but we had no choice but to pay or not get fibre! Even after the $1000 per tenant rebate, we had to pay them $4500. Seemed a bit steep for a simple install. Maybe Wellington gets a different treatment? And the $4500 didn't get us anything complicated. They put two straws upstairs (where they would have put our one for free anyway). And they put three straws downstairs in a similarly easy to reach location again about 10m from the fibre in the street. I can quite see why generically, building owners would baulk at the cost and not bother to get it installed... even when it is right outside the door. If we weren't using the building ourselves it would have been very difficult to justify the cost for our tenants (who didn't want to pay anything for it), but we needed the connection too much ourselves to not get it installed. We were told once they decided it was MDU, it was all or nothing. Single install wasn't an option. Not sure about anyone else but to me it seems excessive to dismiss NZ altogether and move to London because Dunedin, a town of <150,000, about as far from the southern cross cable or any decent peering exchange as you can get in NZ, doesn't have fibre into the 2-3 office buildings they checked. xpd: Hissy fit. Plain and simple. If he dosent like it, he can move the office somewhere else, easy. If he moved overseas it would probably lift NZs IQ average. sbiddle: Any credibility he had goes out the door when he suggests broadband is better on a plane. 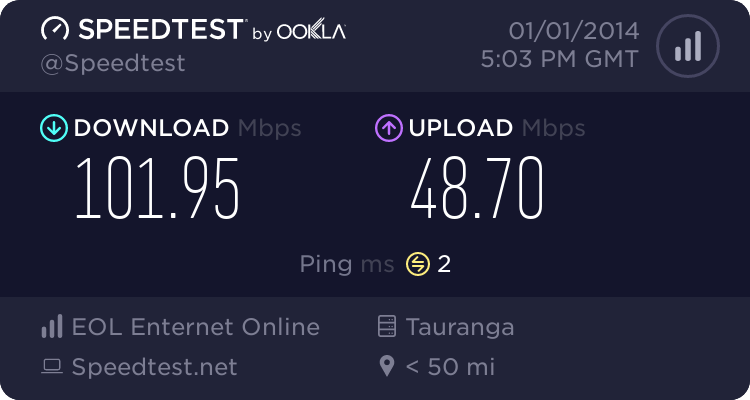 ubergeeknz: Not sure about anyone else but to me it seems excessive to dismiss NZ altogether and move to London because Dunedin, a town of <150,000, about as far from the southern cross cable or any decent peering exchange as you can get in NZ, doesn't have fibre into the 2-3 office buildings they checked. NZ and UK are becoming popular options for (often) quality software development. While the throughput expectations (UK <---> NZ) would not be great, the move is likely because of the reason stated above. TBH he should have looked at Chch. Lots of brand new office spaces popping up everywhere. Programmers coming left right and center out of the uni and polytechs etc. I worked with a client with 30 staff and had adsl only as they could not get VDSL. We ordered it and it took 8 months to get and I was talking with another client that has ordered ufb yesterday and they have been waiting 3 months. So I can certainly understand this guys frustration. cyberhub: I worked with a client with 30 staff and had adsl only as they could not get VDSL. We ordered it and it took 8 months to get and I was talking with another client that has ordered ufb yesterday and they have been waiting 3 months. So I can certainly understand this guys frustration. Thats the exact type of situation I was thinking of. The sort of business he was trying to run has no way of surviving without a high throughput connection, 3 months of downtime could mean having to shut up shop because your investors lost interest. Yep, so get expensive business fibre then. If you've got $100M in investment you can afford it. Work out how much downtime would cost you, and get a backup connection too. Do you have the talk about the wireless network in Horsham as well? That's a good example of a bunch of people just building their own network in a space where the telcos just failed to deliver service. then maybe you should stop listening to anyone posting on this forum. Horsham council public free wifi install? I'm not bashing Mikrotik - it has its place, but that place is not service providers.